I think everyone would agree that education is the key to a healthier lifestyle, but sometimes even the education starts to contradict itself. For example: How many times have you heard something is good for you to later have someone else tell you it's not good for you. One thing that research is showing us is that eating fresh, raw fruits and vegetables can impede the development of degenerative diseases like cancer and heart disease, and contribute to good health in many other ways. Synthetic vitamins do not provide what you need, whole-food based supplementation and nutrition is the key!! 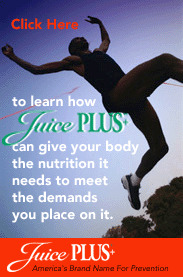 Have you had your Juice Plus+ today? Let food be thy medicine, and medicine be thy food. Click here for information about ESSENTIAL OILS. Click here for more information about PRE-PAID LEGAL advice from top notch lawyers! !